Apple Music wants to bump Spotify out of the top spot for global music streaming dominance. Spotify is making moves to avoid that fate. Both companies have employed unique strategies to obtain new subscribers, from exclusive concerts, podcasts, merchandising, and partnerships. And Spotify is now making some interesting moves in Southeast Asia. 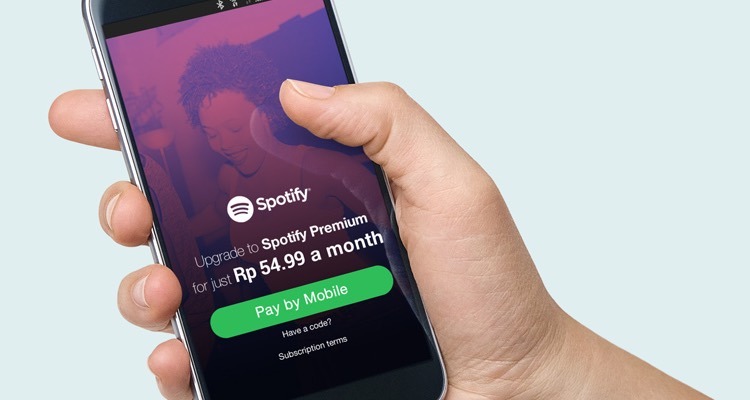 Spotify’s latest partnership with Fortumo in Thailand and Indonesia will allow potential customers to pay for their Spotify subscription carrier billing. Credit card ownership in Thailand is still less than 10%, while more than 65% of the population owns a smartphone. A quick back-of-the-envelope makes this a worthwhile experiment. With these new partnerships, millions of people who have access to online entertainment — but limited means to pay for it — can now do so through their wireless carrier. Using Fortumo’s payments API, Spotify can employ technologies like token-based authentication, automated refunding, and dynamic pricing. Fortumo also has billing agreements with Google Play, Sony, Tencent, EA Mobile, Gameloft, Kinguin, and other online retailers to help customers pay for their digital purchases through carrier billing. The latest expansion opens up two new emerging markets for Spotify on the heels of their successful public offering back in April. In March, the company expanded its presence in Africa for the first time with a launch in South Africa. Apple Music is estimated to be growing at 5% per month globally, while Spotify only sees 2% growth per month per Wall Street Journal figures. Emerging markets have become the new battleground for new monthly active users as first-world markets become saturated. Back in July, the Swedish company started testing a Spotify Lite app that is slimmed down from 100MB to 15MB for emerging markets. Azealia Banks Drops Off House-Inspired "Movin' On Up"